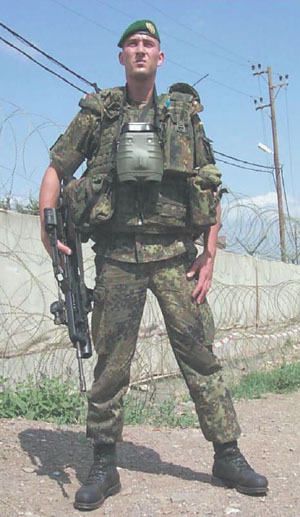 Already fielded, the German army’s Infanterist der Zukunft (IdZ) soldier modernization program consists of a base system that can readily accept new equipment. Designed to support a 10-man mechanized infantry squad, the IdZ kit features modular body armor, a load-carrying vest, a laser rangefinder, an intra-squad radio, ruggedized personal digital assistants, global positioning system (GPS) receivers, a digital camera and night-vision equipment. Network-centric battlefield equipment sharpens the very tip of the spear—infantry squads and platoons. The German army is fielding technologies to enhance its soldiers’ lethality, situational awareness, survivability and operational capability. The new kit consists of an easily upgraded, modular system of body armor, integrated communications and night-vision equipment. Each squad member is fitted with a personal radio and a handheld digital assistant that can receive imagery and tactical data via a local wireless network. The new equipment already has been tested operationally in Kosovo and Afghanistan. Even in a time of precision networked warfare, the presence of individual soldiers on the ground is still vitally important for securing areas and defeating enemy forces. New communications and wireless technologies now allow small units to be more effective and lethal by providing them with direct access to reconnaissance and fire support assets. These systems also help prevent casualties because troops provided with a complete operational picture of the battlefield can avoid mistakes and potential fratricide incidents that can occur in confused and fluid situations. Many nations are in the process of developing technologies to enhance the capabilities of dismounted infantry. One such effort is the German army’s infantryman of the future—Infanterist der Zukunft (IdZ)—program. According to Dr. Jens Gönnemann, vice president of the European Aeronautic Defence and Space Company’s (EADS) Soldier Systems, Hammelburg, Germany, IdZ equipment is the first advanced combat kit operationally fielded by any country. Gönnemann notes that Germany has been involved in a NATO working group for soldier modernization since the early 1990s, but a European standard for soldier systems has yet to be developed. In 1996, the German government decided to launch its own program instead of waiting for the working group to agree on a standard. One reason for this decision was a shift in German military doctrine allowing its forces to deploy outside of Europe. But these new operations expose German troops to new threats. The soldier modernization program was launched to increase the capabilities of small units by providing them with the tools to ensure combat superiority in a variety of situations, he says. Unlike other nations’ soldier modernization programs that are waiting for key systems to mature, the Germans developed a base system that can be modified to fit new technologies as they become available. “We’re not waiting for the big bang in 10 years where we have an I-can-do-it-all system. We do what’s possible, and that is the most advanced thing for the time being,” he relates. The IdZ system was first fielded with German troops in Kosovo in 2002. This June, 15 systems for 150 soldiers were sent to German units in Afghanistan. In late 2004, the German government also will consider funding for an additional 200 units. Gönnemann adds that in early 2005, another 30 systems will be produced for the new NATO rapid response force. Each IdZ system is built around a 10-man mechanized infantry squad. Besides transporting each soldier’s personal kit, the unit’s personnel carrier serves as a “mother ship” to transport squad equipment, recharge batteries and provide communications and data links to higher echelons. IdZ equipped troops can operate away from their personnel carrier for three days, but they can be in the field for up to seven days with their vehicle. The squad’s equipment consists of body armor; load-carrying vests; a command, control, communications, computers and intelligence (C4I) system; a laser rangefinder; observation gear; and nuclear/biological/chemical protective equipment. Additional equipment includes night-vision gear and thermal weapons sights. Gönnemann explains that the goal is to not overload troops with equipment. “Everybody in the group doesn’t have every item. But the whole group can do the job with the items provided to the squad,” he says. For example, each squad has only one laser rangefinder. Although this does reduce equipment costs, it was only necessary for one soldier in the unit to have it, he says. “We have only one machine-gunner and only one sharp shooting rifle in the squad. Everything in the mother ship can be put together for certain tasks, and what’s not needed stays where it is,” he maintains. The heart of the IdZ is its C4I capability called the navigation, information and communication (NAVICOM) system. This consists of an individual soldier radio that carries voice and data communications. Another NAVICOM component is a ruggedized personal digital assistant called a Navipad. The device operates on an encrypted Bluetooth wireless local area network to provide mapping information and imagery. It also serves as a datalink to provide individual soldiers with enhanced situational awareness. “Each soldier in the group knows where his comrades are. Not just in the group, but also at higher levels,” he says. The laser rangefinder is incorporated into a pair of binoculars. 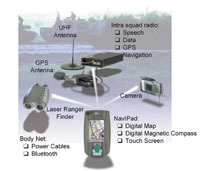 Range data gathered by the rangefinder also are transmitted via the wireless local area network to the Navipad, which may then be shared with squad members or transmitted to other units. In addition, IdZ squads are equipped with a digital camera called a Vector that can transmit data wirelessly. It can be used for reconnaissance purposes as a remote observation device or to identify individuals at checkpoints during peacekeeping operations. Imagery captured by the camera can be transmitted back to headquarters or used by the squad to create three-dimensional digital pictures of buildings or other objectives it may have to attack or secure. A key part of the IdZ system is its command, control, communications, computers and intelligence suite. This equipment consists of an intra-squad radio and ruggedized personal digital assistants known as Navipads. Connected via a Bluetooth wireless local area network (LAN), the Navipads can call up digital maps, use GPS to pinpoint a soldier’s present location, identify target positions and receive orders. Data from the squad’s laser rangefinder and digital camera also can be transmitted to other team members via the wireless LAN or to higher echelons. The IdZ kit features a new modular body armor system. Depending on the mission, the armored vests can be upgraded with additional components and inserts, making it resistant to machine gun fire at its highest protection levels, Gönnemann says. The new vests are lighter, weighing only 10 kilograms as opposed to the 16-kilogram vests they replaced. The armor is designed so that its weight rests on the wearer’s hips, making it more comfortable to wear. Although it is not part of the basic system, Gönnemann would like to see every IdZ equipped squad or platoon have its own integrated micro unmanned aerial vehicle (UAV). He notes that existing systems such as Luna (SIGNAL, September, page 51) are too large for use below battalion level. He also is interested in a helicopter-like system capable of hovering and looking into the upper stories of buildings. Known as the Quattrocopter, this prototype UAV is designed for very quiet flight to shadow enemy units and maneuver in urban terrain. This aircraft will be able to transmit live video data directly to soldiers’ Navipads. Another piece of reconnaissance equipment in development is a remotely controlled wheeled robot that will scout into enemy territory. Like the Quattrocopter, it will transmit real-time video from its sensors to the unit’s personal digital assistants. The system’s modularity allows new technology and equipment to be incorporated quickly. For example, in the near future, Gönnemann sees soldiers’ helmets being enhanced with sensors and interfaces. Using its own development money to design these systems, EADS is seeking to integrate a monocular or binocular night-vision capability into the helmet. Besides providing vision enhancement, it would allow troops to call up maps and other situational awareness aids while allowing them to remain focused on the combat situation. A basic version of this capability already exists in an EADS-designed helmet for use by paratroopers on high altitude night jumps. This specialized helmet has an interface for several functions. “It’s got two more functions than a jet pilot’s helmet. We have to provide the soldier with oxygen, a night-vision goggle, a navigation system and communications. And it has to be a full-face helmet to protect the soldier from the environment up at 30,000 feet,” Gönnemann says. He adds that his goal is to transfer the knowledge and experience gained in developing the paratrooper helmet to the infantry system. The NAVICOM equipment can interoperate with other EADS-developed command and control systems such as the German army’s Faust and the French army’s SIR (SIGNAL, June, page 59). Gönnemann observes that interoperability does not necessarily mean sharing components from one system to another, but having the proper interfaces in place to connect them. Interoperability is necessary from an economic standpoint. Because the German government’s defense budget is limited, the EADS team had to use as much available technology as possible. The high concentration of commercial products in the kit’s C4I system means that they must be able to communicate with each other, he says. The system has proved popular with the soldiers using it. Gönnemann explains that German troops in the Balkans used the equipment to maneuver, surround and capture suspected war criminals. The inter-squad radios and Navipads allowed the soldiers to move quietly without alerting the suspects. He adds that the improved body armor increases soldiers’ feeling of protection, but it is the C4I equipment that strengthens their capabilities. “They know and can see more. They can communicate better than they could in the past, and this has enhanced operations by light years,” he says.